Over this month we have seen the latest advert campaigns for high fashion brands autumn and winter 2012 within featuring in from beauty departments, Vogue to Harper Bazaar. Flying the flag this morning is Jessica Chastain for Yves Saint Laurent. Chastain makes an artistic impression as the face of YSL’s new Manifesto fragrance. 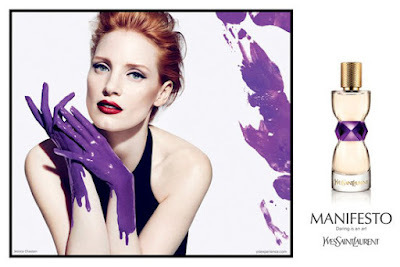 This campaign for YSL sees Chastain get her hands dirty, with one of this season’s autumn and winter most highlighted colour with her hands covered in purple paint. 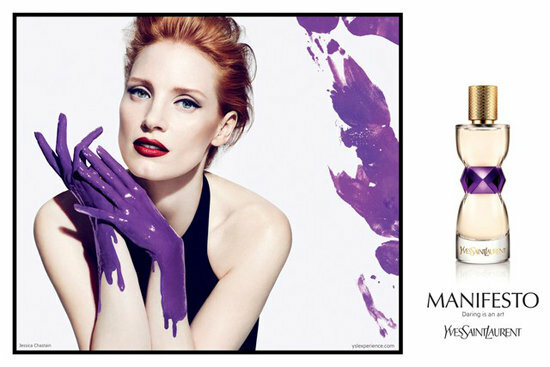 The purple colour palette is synonymous with the label and Chastain’s vibrant hand hue matches that of the bottle. The fragrance scent is woody mix of florals and Orientals, with notes of jasmine, white flowers, vanilla and sandalwood. “The amethyst-hued central section could call to mind a diamond cut jewel belt”, said Stephen Bezy, general manger of Yves Saint Laurent Beaute at L’Oreal Plus. Bezy also gave a description on the fragrance to WWD regarding it as ‘luminosity, charm grace and power and the audacity as well’.